Laboratory on Urban Research » Shanghai: City of Tomorrow? In much of the Western world the future now belongs to the past. The very idea of the city of tomorrow – with its multilayered skyways, housecleaning robots and flying cars – seems doomed to the realm of nostalgia, the sadly comic promise of a future that never arrived. Today – much to the alarm of opinion makers in America – this future is resurfacing in Shanghai. It is most apparent in the science fiction skyline, which functions as an Illuminated ad for itself – the deliberate showcase of an approaching urban destiny. Yet, this economy of anticipation is evident far beyond the city’s most famous icon. On the periphery, in the satellite ‘new towns’ the gardens are manicured and the guard booths are manned, but the streets and squares stand empty. Signs – built long before their destinations – point to markets, schools and hotels that do not yet exist. Closer to the city center, remnants of an industrial past are being transformed into ‘creative clusters’. Disused factories and warehouses – now gutted and wrapped in glass – seek to unlock the city’s creative potential. In a metropolis of close to 20 million people, these abandoned places seem eerie, like ghost towns lying in wait, haunted by those who have yet to arrive. Of even greater concern to the columnists of New York Times and Newsweek is that these physical manifestations are coupled with a palpable optimistic energy, or to use David Brooks’ formulation, an ‘eschatological faith in the future’. Faced with unprecedented urbanization and runaway technological growth, China’s giant metropolis has responded– like the cities of the industrial age – with a confidence in science and technology, a positive belief in progress and a hopeful – even exultant – futurism. My work explores this new futurism as it emerges in Shanghai . 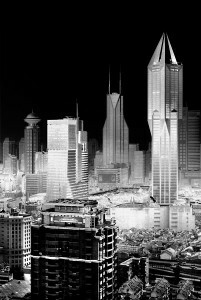 It does so, first, by examining Shanghai’s ambitions for the 21st century alongside the 20th century project of imagining, planning and building a future Metropolis. With its skyscrapers, satellite towns, networks of subways and labyrinthine overpasses that are currently under construction, Shanghai is creating the retro-futurist monuments to a new modernity. This project receives its most overt expression in the approaching 2010 world fair, which explicitly seeks to reanimate the great exhibitions of a previous age. In mapping the ‘City of Tomorrow’ as it resurfaces in a new time and place, my work asks whether the same dynamic that eclipsed yesterday’s dreams of a future metropolis in the West is fated to replay itself in Shanghai. Or, whether, instead, Shanghai might produce its own unexpected and alternative (neo)modernity . In searching for the contours of this new – and unfamiliar – futurism, my work looks for the foreshadowing of a creative epoch that is unique to Shanghai, one that is based not only in the spectacle, visions and plans that come ‘from above’ but also in the shadowy world of unintended, unanticipated innovation out of which the future will undoubtedly arise.